Michelle (skippingstones) recently posted an essay on honesty and openness. Her post got me thinking about how my relationships with friends differ so much, why some friends know some things about me while others know entirely different things, and why I don’t feel like the same me all the time. Then it occurred to me: it happens organically. When I first meet a person, of course I’m consciously making some decisions about what to share with them and what to conceal, but mostly I’m going on autopilot. My habits are making decisions for me. Past experience is determining my present interactions with people who are at first strangers. All of the subtle cues I get from them about who they are also influence how I behave around them. I think carefully about some of these things, but most of my behavior arises from somewhere deeper, beneath my intellect. Emotions drive much of what I do. Then, one day, I pause, and I wonder why I feel like either a slightly or a wholly different person depending on whom I’m with and my relationship with them. At first I’m inclined to think that over time I’ve chosen to hide certain things from certain people and reveal other things to other people and that these were rational choices, made so methodically that if I had perfect memory I might follow them one by one back to my first encounter with each person I know, as if it were a question of Newtonian physics: reconstruct the entire chain of causes and effects and I might arrive at the creation event itself, the beginning, moment one. But then I see the truth: It just happened. At first we were strangers, then, over time, we became friends. We grew together and we changed together. None of us knew what was happening until it had already happened. We didn’t choose to be one way or another with each other. We didn’t choose to hide this and reveal that. It just happened. Our identities and lives became entangled, and out of the complexity of this entanglement relationships formed, all of them different, all of them special, none of them perfect. Only in hindsight does it seem that I chose to be open with this friend and a little more reserved around that friend. The fact is that each of these relationships is different because the people involved are different. I can’t be the same me around everyone I know because everyone I know is different, which means that my relationship, my entanglement, with each of them must also be different. Dishonesty, openness, concealment certainly have a place in the formation of relationships. I concede that. But now I see that what I thought of as “roles” I was playing depending on whom I was with were actually manifestations of mutual relationships that were all unique. I’m not the same around everyone, but I’m still me. WE, however, are different when we’re around each other. Together we’re something more, though we can’t be everything to each other. And that’s OK. Owning the iPad has created in me a need to own an iPad and hover over my virtual self with a compulsion that borders on obsessive. Of course, this argument is with myself, not my iPad. I wanted to go to the bookstore to occupy what Shirley Heath, Stanford social scientist, calls an “enforced transition zone” into which the outside world not only does not, but cannot intrude. In the “enforced transition zone” I regain my freedom. I’m allowed to become lost in myself rather than in the collective of the connected world, where temptations dangle in front of me and images, ideas and suggestions lodge themselves in my mind from moment to moment. I don’t feel like I chose to buy an iPad, or to join Facebook, or to own a cell phone. They chose me, and they marshaled the “decisions” of a billion people all over the world to inveigle me into making a choice that no longer feels like a choice. These devices and services are part of the fabric of reality, and to abstain from them would be to pretend that I don’t walk on solid earth, that I don’t breathe air like the rest of humanity, that I exist on an island and that I have no need of human contact and community. I can’t choose to opt out of life itself. I’m returning today from a trip to Texas. I went to Texas intending to find a job there and to return there permanently. In other words, I changed my mind. I no longer wanted to live in Kentucky. I wanted to live in Texas. But things didn’t quite work out how I had hoped they would. So now I find myself in a hotel somewhere in Arkansas, about halfway to Lexington. Leaving Texas is always hard, because I’m leaving home. I’m leaving memories and people and places that cling covetously to little pieces of my identity. I considered writing for my blog a piece titled “The Geography of Identity” in which I would map out where I’ve left different versions of myself. The child “me” is in Austin. He still clambers up trees, builds tree houses, catches snakes and frogs, scorpions and spiders. His hair is still blonde and it still hangs to his shoulders. I can still see him sitting on a hill of Blue Bonnets next to his little sister, Becky, one Easter weekend when he was four years old; meanwhile his parents are still snapping photos of them both for memory’s sake. 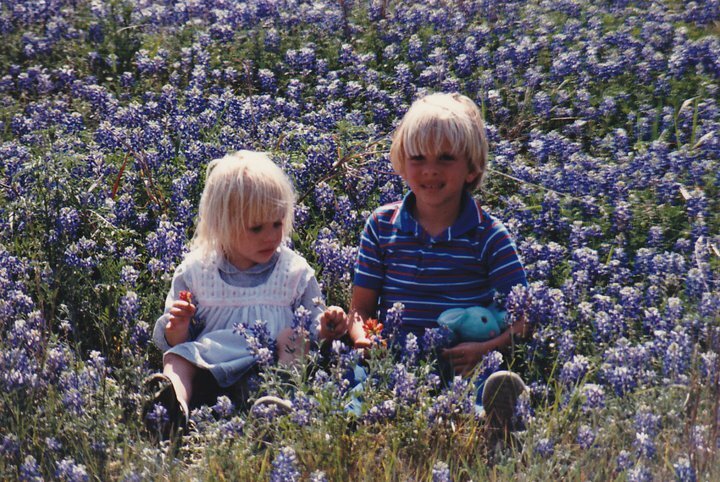 I remember that when my sister and I sat on that hill I was worried about crushing the Blue Bonnets. Actually, I was more than worried. I felt terrible. I also remember feeling silly sitting next to my sister, holding a blue Easter bunny and posing for a picture whose significance I would only understand decades later. What isn’t clear in the picture is that the hill on which my sister and I are sitting rises up from Loop 360, one of the busiest stretches of highway in Austin. Even twenty-six years ago cars streamed down that road nonstop. I was aware at the time that we were posing not only for my parents, but also for hundreds of drivers and passengers as they shot out of town into the folds of the Texas hill country or made their way to Austin’s newest mega-mall: Barton Creek Square. Everything outside of the picture still exists. The four lane highway carries more cars today than when I was a boy, but it looks exactly as it did almost three decades ago. The mall has changed very little on the outside. A few apartments have risen on nearby hills with glorious views of downtown Austin and the thunderstorms that roll in from the east every Spring. Everything in the picture, however, has disappeared. The hill remains, of course, but Lady Bird Johnson and her army of Blue Bonnet enthusiasts stopped seeding that hill soon after my sister and I posed on it for my parents. It wouldn’t surprise me to learn that, in the interest of public safety, the city itself forbade parking on the shoulder of the highway to take pictures. So now, at any given time of year, in any season, if you venture to the hill along Loop 360 you will see neither Blue Bonnets nor little children posing for their parents. Instead, you will see pointy cedar bushes creeping down toward the highway. But in my mind I see something different. The blue bonnets still paint the hill azure, my sister and I are still sitting next to each other among the forest of flowers, and my parents still futz around us with their cameras, always just a moment away from taking a picture that today recalls a moment grown more poignant with time. *I’m going to keep blogging, but I’ll probably post about once a week from now on. I love sharing the world with anyone who happens to read these miscellany. I’ll keep commenting on other blogs, of course. Thank you for your time and conversation. It means the world to me. Writing is a hopeful act. Words assume that someone will read them, even if that someone is an older version of the person who put pen to paper in the first place. Often we write to our future selves. What else is the purpose of a journal? Sure, we’re conversing with ourselves in the present. But most of us write with the intention eventually of reading what we’ve written. We want to know who we were when we were younger, so we record our thoughts as artifacts of our younger years to be excavated when we’re ready. Despite the clarity of our thinking in the moment of writing, the words of our younger selves sometimes make no sense, and as with any excavation, we often are forced to guess at how the pieces of our younger selves fit together. Sometimes we don’t recognize the person we were. He is an alien to us. He was meaner, more arrogant, maybe a little smarter, less jaded, more wide-eyed. I steal often from my younger self. He had ideas that would never occur to me now that I’m older and more set in my ways. He had an open mind. Mine is somewhat closed. If things don’t interest me right away, I’m more likely now to give up on them than when I was younger. Because I assume too often now that whatever seems new is really a dressed up version of something old. Which is to say that I’m suspicious of everything. Suspicion, taken too far, stifles thought and creativity. Suspicion shuts the brain down. A: What do you think of as you fall asleep? B: I think about all the tasks I have to do the next day and I worry over those that I had to do that day. Sometimes I preoccupy myself over weighing too much. Other times, I wonder how I’ve performed in the eyes of my peers and I stress over the impressions I’ve made. More than anything, I get frustrated over how I can never get to sleep. What do you think about? A: Some of the same. But I also spend a lot of time thinking about the distant past: people I’ve known, places I’ve been, occasions that I enjoyed. . . I wonder where those people are and how those places have changed with time. I think of the distant future as well and long for a time when I’m older and life’s experiences have made me wiser. Often I review the day that’s coming to an end. I ask myself if I treated people with love and respect. I note instances when my anger got the better of me or when I said the wrong thing and I vow never to make those same mistakes again. I contemplate a book that I’ve been reading, toss ideas around in my head, imagine what’s happening in other parts of the world to people I’ll never know. I dwell on the incessant pain in my back and neck, but then I remind myself that hundreds of millions of people have it worse. Finally, I try every night to remember that it’s a beautiful world that we live in. . . Oh, and I also get frustrated over how I can never get to sleep. Sometimes all I want to do is point to the sky, lean toward you and whisper, “It’s blue. Isn’t it wonderful? For God’s sake, it’s blue.” I want to tell you about one day in October when I was idling in traffic, stuck in a line of cars at a red light, and I saw a Monarch butterfly flit across the road, all six lanes of it. In all of its black and yellow and orange, its general ignorance of where it was or how ridiculous its task, how pathetic its odds of crossing the thoroughfare intact, it zigzagged through the air. It collided with a fender and only just caught itself before falling to the asphalt. A light breeze whisked it over the roof of a red Camry, then yanked it back five feet so that again it almost fell to the pavement. It picked itself up in mid-flight, bounced off of my windshield, and stumbled gracefully through the air until it arrived at the median. It achieved grace in clumsiness. I don’t know if it actually made it to the other side of the road. All I know is that it survived three lanes of stationary cars and that the traffic lights turned green the moment it reached the median. 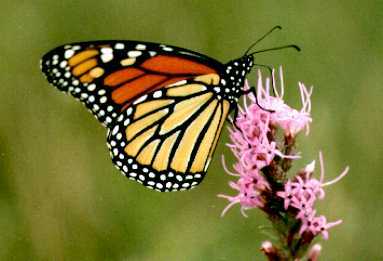 When I was a boy I used to chase Monarchs through fields of flowers in Texas. I used to think that a single butterfly made the Spring migration from Mexico, up through Texas, and into various parts of the Eastern United States and Canada; and that the same butterfly made the return migration back to Mexico beginning in October. In fact, the whole South-North/North-South migration requires four generations of butterflies, the longest-lived of which is the generation that winters in Mexico and swarms in Oyamel forests to the delight of tourists. The butterfly I saw in October was a member of this hardy generation, charged with reaching Mexico and surviving for the next six months so that come Spring, it could join its peers in journeying northward to ensure the survival of the entire species. It represented one leg of a long-distance, multi-generational relay. A six-lane road must have been among the least of its obstacles. A gleeful little boy may have been its worst enemy. I was sitting alone in McDonald’s this morning, catching up on the news with my e-reader (for which I needed the internet), when from a neighboring table I heard a woman say, “Honey, you’re not supposed to be sad. It’s a treat.” I looked over and saw a woman with short, curly grey hair holding a small plastic spoon to the mouth of a two year-old boy. He had blond hair that dangled down to his blue eyes. A tear traced down his cheek. The boy turned to me and raised his eyebrows, as if wondering where I had come from. “Has he eaten ice cream before?” I asked. “You’ve got that right,” said a woman at another table. She laughed, and added, “And we love them for it.” This woman sat across from a boy who looked to be around twelve years old and who had the broad shoulders of a middle-school linebacker who would likely fill out to become a giant in just a few years. The grandmother coaxed two spoonfuls of vanilla ice cream into her grandson’s mouth. He raised his hand to the plastic spoon and helped his grandmother guide it toward him. Now he smiled. I wasn’t sure if she was joking or serious, so I said nothing. “More men are doing that nowadays,” said the grandmother as she raised another spoonful of ice cream to her grandson’s mouth. “I know a few guys who get pedicures, or at least manicures,” I said. “You should try it,” said the mother. I do know men who have gotten manicures and pedicures, but sitting in McDonald’s, contemplating whether or not I would seek out either of these services myself, I didn’t know how to respond. We all confront moments when we’re asked to lift something from an old category and place it into a new one. I think of getting a pedicure as something women do, but for most of human history no one got pedicures, so why not men, now? Because it’s not “manly,” but manliness is another quality that we define differently over time. A lot of men file their nails and style their hair. Does that make them unmanly? This whole conversation just got me thinking about the power gender stereotypes exert on our lives, how they influence who we become, what we do, and what we think we’re capable of doing. A study was conducted several years ago in which two groups of college students took a math test. To one group the proctor read the standard instructions for most standardized tests. Think SAT or GRE. To the other group the same proctor explained that men and women typically perform equally well on the test they were about to take. In the first group, the men outperformed the women. In the second group, the men and women performed equally well. What’s the difference? The hypothesis (pretty well borne out) is that women in the first group went into the test with deeply internalized stereotypes about the supposed superiority of men in all things mathematical. Anxiety springing from the stereotype itself impaired performance. Women in the second group were told that the stereotype was false, thereby alleviating their anxiety and removing it as an inhibiting factor in their performance on the test. These kinds of studies have proliferated over the years. Many of them tackle racial stereotypes and reveal them to be as harmful and distorting as gender stereotypes (which seems pretty obvious). I’m sure I summed up some combination of various studies here, but the general point remains: stereotypes affect us in ways we’re not always aware of, and the worst stereotypes have a way of sneakily contributing to the result they predict. The limber years of scientists, as for athletes, generally come at a young age. Isaac Newton was in his early twenties when he discovered the law of gravity, Albert Einstein was twenty-six when he formulated special relativity, and James Clerk Maxwell had polished off electromagnetic theory and retired to the country by thirty-five. When I hit thirty-five myself, I went through the unpleasant but irresistible exercise of summing up my career in physics. By this age, or another few years, the most creative achievements are finished and visible. You’ve either got the stuff and used it or you haven’t. . .
Why do scientists peak sooner than most other professionals? No one knows for sure. I suspect it has something to do with the single focus and detachment of the subject. A handiness for visualizing in six dimensions or for abstracting the motion of a pendulum favors a nimble mind but apparently has little to do with anything else. In contrast, the arts and humanities require experience with life, experience that accumulates and deepens with age. In science, you’re ultimately trying to connect with the clean logic of mathematics and the physical world; in the humanities, with people. Even within science itself, a telling trend is evident. Progressing from the more pure and self-contained of sciences to the less tidy, the seminal contributions spring forth later and later in life. The average age of election to England’s Royal Society is lowest in mathematics. In physics, the average age at which Nobel Prize winners do their prize-winning [usually for work that began in their twenties] is thirty-six; in chemistry it is thirty-nine, and so on. . .
. . . I hold no illusions about my own achievements in science, but I’ve had my moments, and I know what it feels like to unravel a mystery no one has understood before, sitting alone at my desk with only pencil and paper and wondering how it happened. That magic cannot be replaced. . . The short span of a physicist’s productive career has always fascinated me. What is the reason for its brevity? I think that Lightman touches upon an answer to this question. At the heart of physics is a yearning to understand, to explore the unknown, to discover. In this circumstance, the value of youth is that it is less clouded by experience. Youth lacks the prejudices and preconceptions that must of necessity accumulate as one ages. In a discipline where groundbreaking solutions often defy everything we thought we knew about the world, the fresh perspective and exuberance that often go along with youth are invaluable. Something that Lightman doesn’t mention is the vehement criticism the older physicists of Einstein’s time directed at his theories of relativity. A large part of the physics community dismissed his theories as nonsense. The older we get, the more we must try to fit things into a framework for life and for reality that we’ve developed over time, whereas in our youth we’re still in the process of creating that framework. In general, that our framework becomes more rigid as we age is not a bad thing. In many cases–perhaps even most cases–that framework survives because it works. It is the product of a lifetime of taking in and processing an overwhelming load of experiences. In short, it is the result of years of trial and error. This may be an oversimplification, but there is a grain of truth to it. Oftentimes the youth of a culture are the primary catalyst for change, while the older generations are a check against that change. Each serves an important purpose. On the one hand, the young infuse a society with adaptability, while the old serve as a break against excessively radical change. My greatest fear in aging is not that I’ll lose my athleticism or my youthful appearance. Rather, I fear that I might forget what it’s like to experience something for the first time. For every experience that I have–both good and bad–the realization rests in my mind that I’ll never again repeat that experience. I’ll never again know with total fidelity how it made me feel: how it made my heart race, or my adrenaline flow. . . or how it brought me to tears of joy or tears of sorrow. I fear losing the ability to see things in the world that don’t fit my framework, my paradigm. I fear losing novelty, of living without the sense of awe and childlike wonder at this world that make life worth living. Perhaps the greatest challenge in aging is balancing the fruits and insights of experience with the chaos and novelty of youth–of becoming wiser, but not at the expense of our openness to new things. *I don’t know about that story I wrote in my last post. I was trying to capture that feeling of experiencing something (the ocean) for the first time, and in particular doing so with someone for whom the experience is not new. Except that in the story, the experience of seeing the ocean is new for both the father and the son for different reasons. For the son, the ocean is new because he has never seen it. For the father, the novelty lies in seeing the ocean for the first time WITH his son, sharing it with him, and allowing him to interpret it as he likes, as a child might. I kind of rushed it yesterday, even though it’s something I’ve thought about writing for a while. Don’t know if it worked! I’ll probably post more fiction here and there for fun… I think?